The Mandolin Archive - Vintage Gibson Mandolins, Lloyd Loar F5 and more! Here at the archive we are always interested when something unusual crops up, and this mandolin has 2 features that really grabbed our eyes. First off, the tailpiece cover has just a bit of wear on it at the base, from which you can see the layers of silver plating over the brass substrate. It also has two half-circle cut-outs, which shows that it would be also at home on a K5 or L5 trapeze-style tailpiece. Finally, the case has a the least common silk interior with a blue lining, and is currently the only one of these we have pictures of in the archive. 95155 - Sam Bush's "Hoss"
Thanks to all the contributors of these images, and please keep them coming! Original Gibson custom work? Check. Single-piece back? Check. 10-strings, and custom-cut handel tuners on a bizzare huge F4-style peghead? Check. Here's a new listing for an instrument that turned up about a year ago, now with serial #11606 confirmed by the anonymous owner. I've had a listing of Wiens Mandolins here for a while with a teeny link at the top of the page. Jamie's recently provided me with details on most of the instruments he's built so far, so I thought I'd draw a little more attention to this gallery. I'm a fan of Jamie's work (I have #23! ), and I highly recommend him. Loar-signed F5 mandolins from the golden age of bluegrass are thin on the ground. This Loar F5, #71628 was formerly owned by Pee Wee Lambert. It has recently been restored by Steve Gilchrist back to a much more accurate and original hue. A flowerpot March 31, 1924 Virzi Loar mandolin with silver hardware was stolen from the Bright Angel Lodge in Grand Canyon National Park on September 4th, 2007. Please help us find this instrument. If you have any information please contact Anyone having information, please contact Ellis at 1-800-289-8837 X107. Here are some wonderful photos of a late 3-point F4 provided by the anonymous owner. By 1910, Gibson was starting to make changes to their instruments in a burst of creativity similar to the push in the 1920s during the Loar period. By the time 10395 was made, the Tailpiece cover had changed it's shape, the label no longer bore Orville Gibson's face, and the pickguard was no longer inlaid. Shortly after this example, Gibson would change the body shape to remove the 3rd point, a design that would be retained until approximately 1922 when the first F5s were made. For a brief period, Gibson offered "Junior" models of their Guitars, Mandolins, and Banjos. The pair pictured here are both Snakeheads from 1924 and 1925 respectively. Gibson Ajr Snakeheads tend to have a particularly nice tone compared to their more ornamented bretheren, and they are often overlooked by players and collectors alike. We've recently added some images to Style U Harp Guitar #2502, which has the lowest known serial number on any Gibson factory instrument. Note the extra-wide soundhole, and the very thick pieces of wood that were used in the carving process. You can also check out what out friends at harpguitars.net have to say about #2502. I've been catching up on all the various goings-on in the world of web pages since the mesozoic period when I learned HTML. The results so far are some new visuals when you look at individual pictures. Try toggling full screen mode with the f11 key (if you're running windows or Linux). This will hide your start bar and toolbars, but they'll come back if you press f11 again. 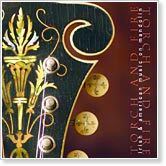 My new CD is titled Torch and Fire. Regular Mandolin Archive readers will recognize the Schultz Loar from this home page (March 31, 1924 signed Lloyd Loar F5 #76547) which appears on the majority of the tracks on my new CD, and indeed inspired it. Tim O'Brien, Mike Bub, Zan McLeod, Kevin Macleod, Craig Harbauer, and Chipper Thompson appear as guest artists, along with London Irish mandolin ace Mark Conyard. Hop on over and check out the Schultz Loar in action on the mp3 audio sample clip! Our friend Charlie Derrington's life ended early on the first of August when he was killed in a traffic accident. We're happy to support the Charlie Derrington Memorial Fund that was set up by friends and family of Charlie to benefit the wife and daughter he left behind. Please join us in making a donation to Charlie, his support and guidance was a very large help to the Mandolin Archive, as well as other mandolin interest groups both on and off line. Here's a short video clip showing Charlie doing what he loved, playing a Lloyd Loar mandolin. Charlie's name was put on the map when he repaired Bill Monroe's Mandolin after it was smashed to splinters by a vandal. Here are the before and after views of that well-known instrument. I've recently had my hands on 73485, and have completely replaced the pictures with some new ones. It's quite a feeeling to have a 1923 Loar with a 1930s finish on your lap. The look says "Sam Bush Period" but the tone is archetypal Loar. Here's a fantastic Torch & Wire inlaid F4 that is sitting in my living room right now. At serial #9100, this old-timer dates to around 1910, just when the raised pickguard came into being with 2 violin-like chin rest clamps. I've always thought that these are the absolute pinnacle of the early Gibson aesthetic, with wonderfully sharp scroll carving, subtly figured backs with very early sunburst shading, and the most elegant peghead inlay Gibson ever produced. Loar F5 numbers 73485 and 73486 (information pending) were both made known to us this week. Pictured is 73485, a very interesting instrument that is making us re-think some of the theories on how some Loars manage to have features of later periods in Gibson's history. Also nice to see here are some of the picks described in the service manual (the "Kork Grip" picks listed on page 9). According to the introduction, the service handbook was supposed to be kept in the case of the owner's Gibson. We're not really sure if these were included with new instruments because only one copy is known to exist. The pages are full of tips and advice, lists of parts that were available at the time, advertisments, and a few pictures & diagrams to help you understand your vintage Gibson instrument. 1922 Loar Resurfaces, Spent last 50 years on Top of a Piano! A wonderful 1922 f5 has just re-appeared to us after many years in obscurity. Kindly provided by the anonymous owner are several first look images to see. One of the earliest serial numbers, this one has a light finish and several other interesting features we hope to document in more detail very soon. CMT has the scoop on how Nashville Philanthropist Bob McLean made it possible for Bill Monroe's legendary Loar mandolin to find a new permanent home at the Country Music Hall of Fame in Nashville, Tennessee. What's it Like to Have a Loar in the House? I recently had the fabulous experience of borrowing The Schultz Loar for four months, culminating in a recording session in Nashville. I've chronicled my experiences with this wonderful instrument in my Loar Diary. In the coming days I'm also going to add many new photographs of this instrument that I took with my digital camera. Sometimes I really prefer the cleaner look of an unbound F2 scroll to the fancier F4. Chipper Thompson is a musician friend of mine, and he plays a mean mandolin. This one has a rattlesnake rattle inside the soundbox, a traditional appointment that gives it an extra hint of menace when played. If you prefer a third point on your F2 pictures, here are some pictures of pokey, the new mandolin in my house. We've been doing little housecleaning here at the archives for the new year. 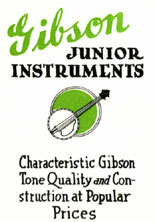 First off, here're a couple of views of the Gibson Junior Instruments brochure.. Page 1 and Page 2 in large jpeg format, or in a single 1Mb Acrobat PDF file. You might have noticed that we now have a link for articles at the top of the page. George Gruhn has written an article on Orville Gibson's Last Mandolin to help us innagurate this new section. Next off, if readers happen to have a collection of original Gibson catalogs or brochures they wouldn't mind sharing with the archvies, please get in touch. We're aiming to eventually have every original Gibson catalog available here at the archives. I took approximately 350 pictures at Wintergrass this last weekend, these are my personal favorites of the bunch. Some of the best shots I've ever taken, if I do say so myself! There were at least 6 other Loars at the festival that I have still in the camera, plus an absolute gaggle of Gibsons from John West.. Here's a new feature getting started at the Mandolin Archive, Nugget Mandolins. Since they first appeared on the scene, Mike Kemnitzer's "Nugget" mandlins have been turning heads and tickling ears. We're working with Mike to add records for the many mandolins he has built, but please contact us if you have one you'd like to share pictures of on the Archive! We've also added an Advanced Search Page with some more interesting collections of unusual instruments indexed therin. There's a new big push to add instruments here from the lengthy notes of Charles Johnson, more being added each day. Lowell Levinger has done it again, coming up with this incredible white top mandocello. First one of these I've ever seen. The white top on the A3 is uncommon, but was a standard catalog item. Frank Ford of Gryphon Strings took some fascinating pictures of this white finish F2 a while back. The Schultz Loar resurfaced recently when owners Jack & Sharon Schultz did a web search on "Lloyd Loar", the signature they saw inside the mandlin they'd inherited. Lavishly photographed in remarkable detail, this wonderful 1924 Fern certainly dazzles us here at the archive. An inside source tells us the sound is pretty special too, and it is soon to appear on a new recording. Details on that will be posted here as they come forward.